1.Inatomi T, Spurr-Michaud S, Tisdale AS, Gipson IK : Human corneal and conjunctival epithelia express MUC1 mucin. Invest Ophthalmol Vis Sci 36 : 1818-1827, 1995. 2.Inatomi T, Spurr-Michaud S, Tisdale AS, Zhan Q, Feldman ST, Gipson IK : Expression of secretory mucin genes by human conjunctival epithelia. Invest Ophthalmol Vis Sci 37(8):1684-1692, 1996. 3.Inatomi T, Tisdale AS, Zhan Q, Spurr-Michaud S, Gipson IK : Cloning of rat muc5AC mucin gene : comparison of its structure and tissue distribution to that of human and mouse homologes. Biochem Biophys Res Commun 236:712-715, 1997. 4.Gipson IK, Inatomi T: Cellular origin of mucins of the ocular surface tear film. Lacrimal Gland, Tear Film, and Dry Eye Syndromes2, 221-227, 1998. 5.Inatomi T, Nakamura T, Koizumi N, Sotozono C, Kinoshita S: Current concepts and challenges in ocular surface reconstruction using cultivated mucosal epithelial transplantation. Cornea 24 (suppl): S32-S38, 2005. 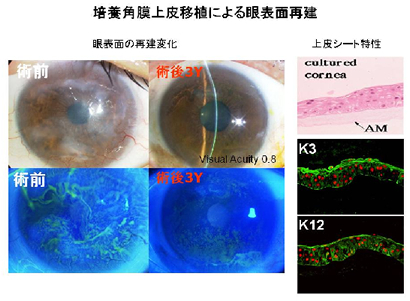 7.Inatomi T, Nakamura T, Kojyo M, Koizumi N, Sotozono C, Kinoshita S: Ocular surface reconstruction with combination of cultivated oral mucosal epithelial transplantation and penetrating keratoplasty. Am J Ophthalmol 142:757-764, 2006.